Social issues usually tend to create social media buzz in this digitally-driven age. They are likely to be discussed on Facebook posts, Twitter tweets and sometimes complete blog posts. And brands that are tuned in with their consumers are banking on this power of social media conversations by capturing key social issues in their advertisements. So while a brand showcases its product, it also weaves in a social talking point by virtue of which it hopes for a wider social reach – possibly a ‘viral’ effect on social media. And the flavour has been “women empowerment” ever since the country was on the hunt for a new leader and a progressive nation. Quite a few brands have been quick to plug in a ‘women empowering theme’ into their brand communication. Sometimes directly or at times using clever plugins. Here, we take a look at advertisements showcasing ‘stronger’,’ independent’ and ‘progressive’ women that created quite a stir on social media in 2014. In fact, this year quite a few leading ladies of Bollywood also leveraged the ‘respect for women’ theme on social media and gained massive support from their followers. 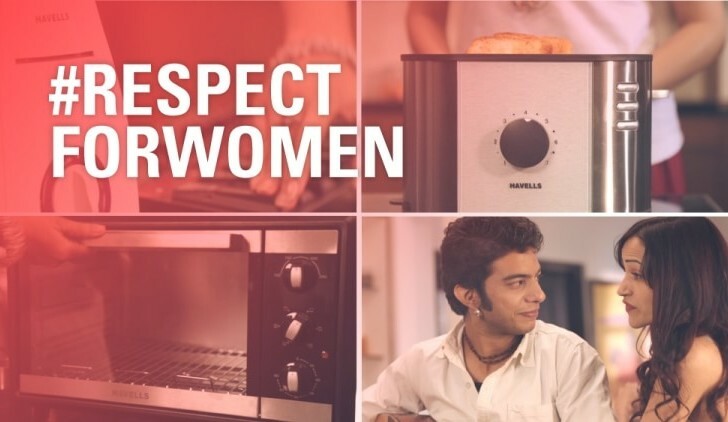 Extending the brand’s message of ‘Respect for women’, a 3-minute video featuring Vasudha Sharma from the pop band Aasma and Sarthak Mudgal a renowned percussionist, was created later around the central theme that ‘a women’s place is not in the kitchen alone, but it is wherever she wants to be’. Interestingly, the musical beats have been created with the help of everyday appliances used in the kitchen. More about campaign here. The latest ad film for Titan Raga celebrates the progressive, confident and passionate woman who makes her own choices and does not live to regret them at all. The minute-long film highlights the central theme in conversations between a confident young woman (played by actress Nimrat Kaur) and her ex-boyfriend in a chance encounter at an airport lounge. The film hit the right chords on social media with responses like “Subtle yet so powerful”, “Contemporary and cool” to amazing, superb ad. More about the campaign here. For the promotions of its Smartphone Network, Airtel launched a much in social media debate film called the ‘Boss’. The 1.31 minute film features a female boss who wants the job to be completed before her team leaves for the day. It is only after she returns home late evening and starts cooking for her husband who is busy working late, and whom she is seen urging to come home early using her smartphone, does the viewer realise that she is his boss. More about the campaign here. In celebration of its seventh anniversary this October, Vogue India embarked on a social awareness initiative called #VogueEmpower to bring about a change in the way we perceive women’s right to empowerment. The idea was to raise awareness with a simple message – ‘It starts with you’. As part of a 360 degree campaign, the brand roped in several prominent celebrities to give their voice to the initiative. Director of Queen, Vikas Bahl created a short film titled ‘Going Home’, in which we visualise a utopia for women, where, unlike today, mistrust and fear don’t dictate actions and decisions. The 5.37 minute film featured actress Ali Bhatt returning home alone at night when her car breaks down and she is seen asking for help from a group of five strangers. Since the movie is set in ‘utopia’, what we see next is completely unpredictable. The five burly men actually drop her safely back home! Director Vinil Mathew created a two-minute film titled ‘#StartWithTheBoys’ featuring actress Madhuri Dixit. It highlighted how we bring up men from the time they are little boys by telling them ‘boys don’t cry’ and what this leads to. The film leaves us with the message on what we should be teaching them instead – ‘boys don’t make girls cry’. Both films were welcomed for their creative quotient but also received severe social media backlash. The idea that we need to start with the boys or teach men to be trustworthy did not sit well with the common folks on social media who are constantly bombarded with news of rapes and sexual assaults on women. More on the campaign here. KitKat India’s 4-minute Diwali Music Video featured a lonely astronaut out in space missing her family back in India. Although the storyline did not deal directly with ‘women empowerment’, it said a lot by featuring a female astronaut as the main protagonist. The beautiful story is set inside a spacecraft where we can see her missing her family and looking outside when the spacecraft moves over India. On Diwali day, she receives a KitKat and is happy to be over a brightly lit up India. More about the campaign here. For Women’s day this year, Godrej Appliances launched a DVC breaking misconceptions that women are not as tech-savvy as men are, while also showcasing the brand’s products. It featured a multi-tasking woman who is at ease with technology at home and at work. But she feels she isn’t being appreciated for all that she does for the family, through a sweet story involving her blogger husband. More about the campaign here. Most brands catering to the urban consumer are shifting towards meaningful advertising with ads designed to garner more likes, more tweets and shares across social networks. Looking forward to what the theme will be in 2015 and how brands are going to weave in the most ‘talked about’ topic into its communication.